Austin – Following state budget cuts, hundreds of Northeast Texas babies and toddlers with disabilities and developmental delays have missed out on Early Childhood Intervention (ECI) services, according to a new report by Texans Care for Children. Between 2011 and 2016, ECI enrollment in Northeast Texas fell from 1,896 to 1,458, a decline of 23 percent despite the region’s overall population of young children remaining flat. The decline in children receiving ECI services was particularly steep in Bowie County, Cherokee County, Henderson County, and Smith County and among Black and Hispanic children in the region. Statewide enrollment fell by 10 percent during the period. “As a former public school teacher and now a Chairman of the House Committee on Corrections, adequate ECI funding is essential in ensuring that all Texas have a quality educational opportunity that prepares them to make positive contributions in Texas,” said State Representative James White (R-Woodville). The report builds on Texans Care for Children’s November 2016 statewide report on ECI and August 2017 report on ECI in North Texas. Today’s report provides an update on statewide developments and focuses in on the Tyler-Longview region of Northeast Texas region composed of Smith County, Gregg County, Cherokee County, and 20 other less populated counties. Support for this report was provided by the Episcopal Health Foundation. Under the state-federal ECI program, the Health and Human Services Commission (HHSC) contracts with 44 community organizations to provide coordinated services to children under age three with disabilities and developmental delays. The three Northeast Texas ECI contractors are Opportunities Inc., ECI Texoma, and Community HealthCORE ECI. The largest contractor in the region, the Andrews Center, closed its ECI program in 2016 due to state cuts. State appropriations for ECI have fallen since 2011, decreasing from $166 million in FY 2011 to $148 million in FY 2018. In 2015 Texas legislators also reduced the Medicaid reimbursement rates paid to providers who offer speech, physical, occupational, and other therapies to children with disabilities. The Texas House unanimously passed legislation to reverse the Medicaid cuts during the recent special session, but the Governor and Senate did not take up the issue, leaving the cuts in place. Regarding the condition of ECI across the state, the report notes that six ECI contractors withdrew from the state program in 2016 and 2017, leaving 44 contractors in place. While ECI enrollment has partially rebounded in recent years, including a five percent increase between 2015 and 2016, overall enrollment is 10 percent lower than in 2011 despite a four percent increase in the number of Texas children under age three. While the state cuts affected children of all backgrounds, there was a disproportionate impact on Black children. Statewide ECI enrollment of Black children decreased 30 percent from 2011 to 2016, compared to 10 percent among Hispanic children and 8 percent among White children. The closure of the Andrews Center ECI program in Tyler provides an example of the way that closures can lead to gaps in ECI services for children, decreased enrollment, a loss of community knowledge regarding the availability of ECI, and other challenges that add up to children being left out of ECI. In Northeast Texas, certain communities faced particularly steep and concerning enrollment declines. The number of children receiving ECI services fell sharply from 2011 to 2016 in Bowie County (33 percent), Cherokee County (46 percent), Henderson County (38 percent), and Smith County, the home of the City of Tyler (29 percent), while none of those counties experienced a decline in the population of young children. 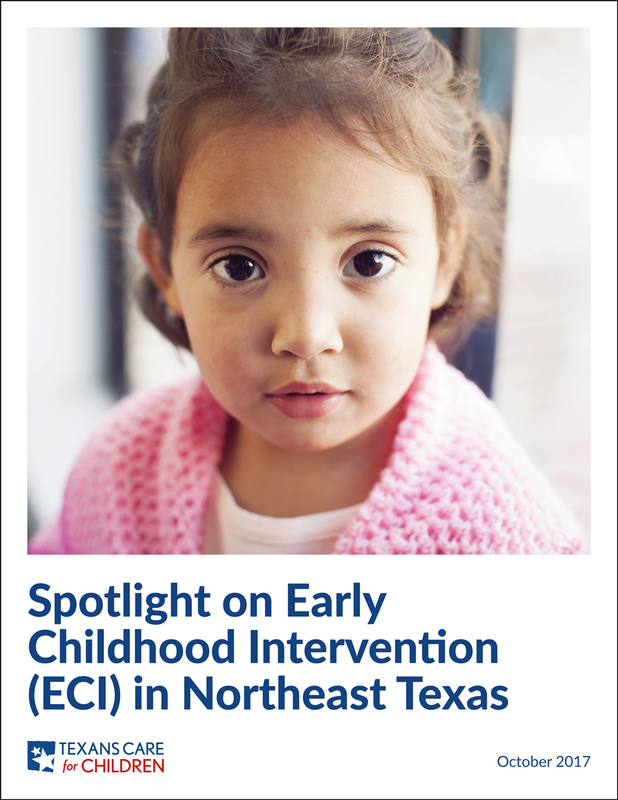 ECI enrollment of Hispanic children in Northeast Texas decreased 41 percent from 2011 to 2016 despite a four percent increase in the region’s population of Hispanic children under age three from 2011 to 2015. ECI enrollment of Black children in Northeast Texas decreased 39 percent from 2011 to 2016 while the region’s population of Black children under age three decreased two percent from 2011 to 2015. Titus County and Gregg County fared relatively well compared to other counties, experiencing level enrollment and a six percent decline in enrollment, respectively, from 2011 to 2016.